A postcard of Lock Twenty-Four on the Old Welland Canal (First), Thorold, Ontario. c1910. 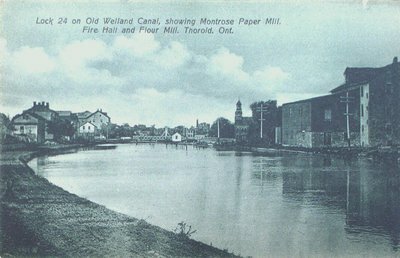 Buildings shown include: Montrose Paper Mill (formerly Keefer Cotton Mill, established in 1848), The Fire Hall established 1878 and the Flour Mill (1846). Published by F.H. Leslie, Niagara Falls, Canada.